This Lucas Oil High Performance 20W-50 SAE Motorcycle Oil serves to lower the overall engine temperature while raising the oil pressure, reducing noise, and allowing for longer component life. Lucas Oil High Performance 20W-50 Motorcycle Oil is formulated with an exclusive additive package not found in other brands. It is formulated to lower engine temperature and raise oil pressure, reduce noise and increase performance. It has been approved for use in all engines that call for a SAE 20W-50 motor oil. 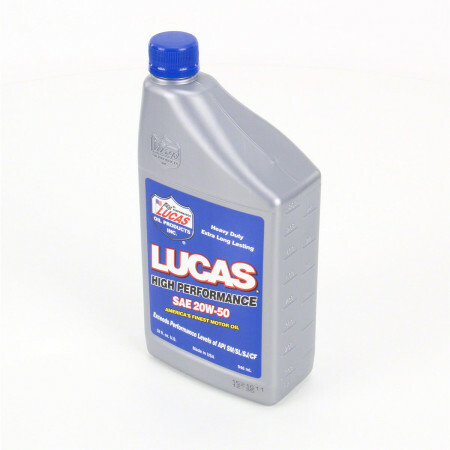 The Lucas Oil performance oils are a result of years of blending motor and gear oils specifically for the racing industry. These are true racing oils that exceed all manufacturers specs and have been proven to outlast other oils by up to 4 times.